Samples of the artists' work can be found here. ​More information about the workshops and registration forms here. 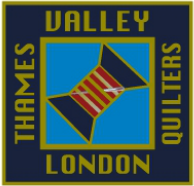 For the year 2018/2019, workshop fees are $45 per member and may be paid either by cash or cheque to the Thames Valley Quilters’ Guild. Payment is due at the time of registration. Any remaining spaces will be made available to members of other guilds or to friends of TVQG members. Workshop fees for non-members are $50. Supply lists will be provided at the time of registration. Supply lists will also be available on-line (if possible). Class size is limited to 15 participants when sewing machines are used. 1. Workshop fees are non-refundable. 2. In the event a participant is unable to attend a workshop, a refund will be given ONLY if another participant can be found. 3. If a workshop is cancelled due to lack of interest, all workshop fees will be returned.